In April 30, 2017 post on longfin smelt, I wrote that it appeared that longfin were making a comeback after the 2012-2015 drought. In this post I compare the 2017 comeback to those in the two previous wet years, 2006 and 2011. First: The number of adult longfin smelt collected in the December 2017 trawl survey (Figure 1) was substantially less than the number collected in the December 2011 survey (Figure 2). 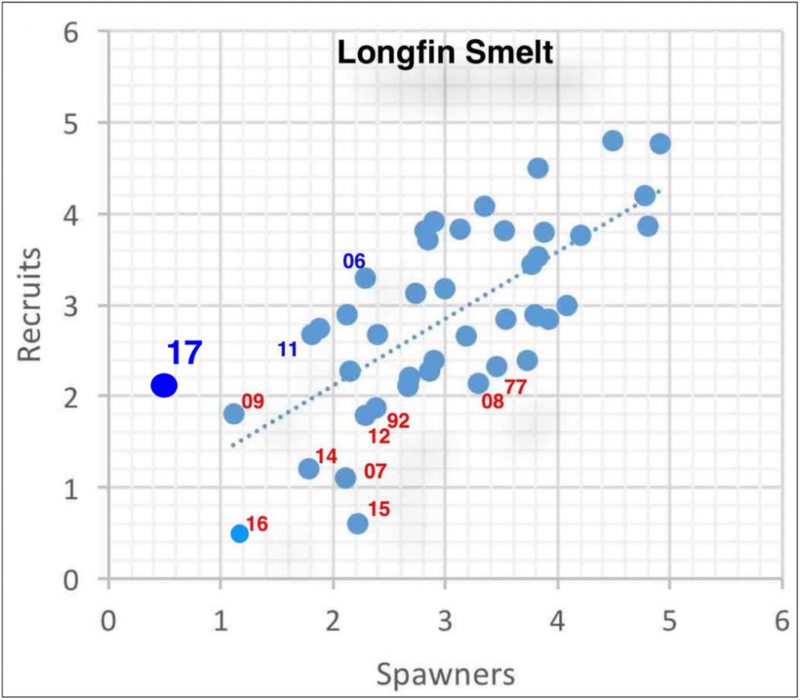 Second: The number (density) of larval longfin smelt collected in the late January 2018 larval fish survey (Figure 3) was substantially less than the number collected in the late January 2012 survey (Figure 4). Third: The 2017 index, though higher than the dry years that immediately preceded 2017 and indicative of some recovery, remained below the recent wet years (06, 11) and continued a long-term trend of progressively lower indices (Figures 5 and 6). Figure 1. Catch distribution of adult longfin smelt in the December 2017 trawl survey. Source: CDFW survey online report. Figure 2. Catch distribution of adult longfin smelt in the December 2011 trawl survey. Source: CDFW survey online report. Figure 3. Catch distribution of larval longfin smelt in the late January 2018 larval fish survey. Source: CDFW survey online report. Figure 4. 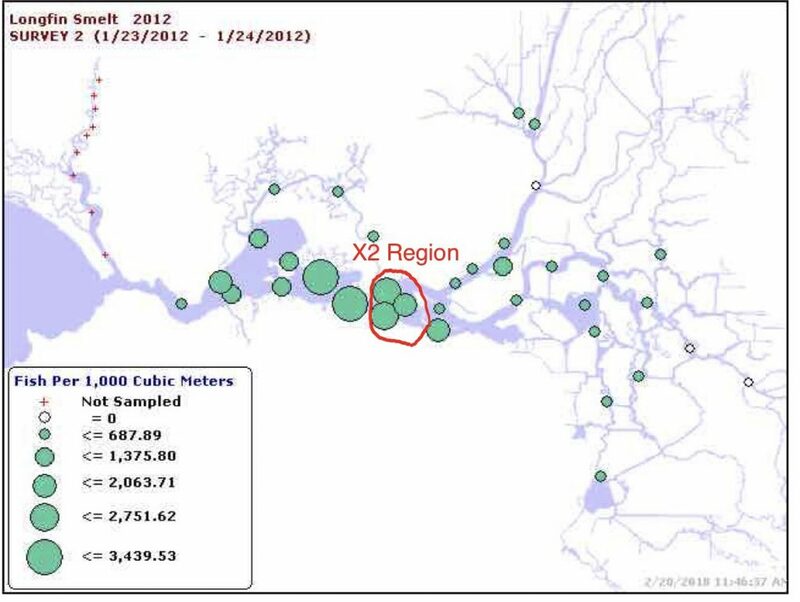 Catch distribution of larval longfin smelt in the late January 2012 larval fish survey. Source: CDFW survey online report. Figure 5. Fall Midwater Trawl Index for Longfin Smelt, 1967-2017. Source: CDFW FMWT Survey. Figure 6. Longfin Recruits (Fall Midwater Trawl Index) vs Spawners (Index from two years prior) in Log10 scale. Note the progressive decline in recruits in the last three wet years (06, 11, 17). The relationship is very strong and highly statistically significant. Taking into account Delta outflow in winter-spring makes the relationship even stronger. Recruits per spawner are dramatically lower in drier, low-outflow years (red years). Source: http://calsport.org/fisheriesblog/?p=1360 . Oroville hatchery steelhead smolts being released into the lower Feather River near Boyd’s Pump in early February. CDFW photo. State and federal agencies have begun stocking over a million steelhead smolts from Central Valley hatcheries into the Sacramento River and its tributaries.1 Fishing reports in the SacBee and other sources note that the annual stocking provokes a strong striper bite in the river, one of the more popular fisheries in the Central Valley. The yearling smolts are the perfect food for stripers. 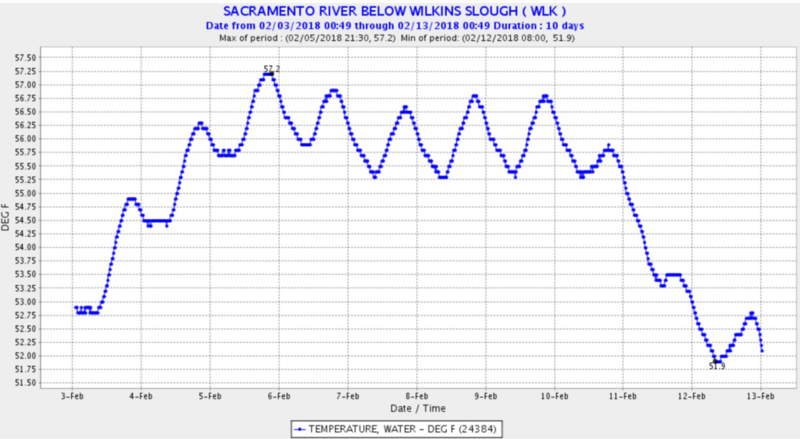 Shasta, Oroville, and Folsom reservoir releases are each at about 3000 cfs, low for mid-winter. As a result, along with the record warm weather, river and Delta water temperatures (Figures 1-4) have been in the preferred range for striped bass feeding (55-65°F). The federal Coleman hatchery near Redding released its steelhead smolts in January during high flows, before the warm weather arrived and stripers began feeding in earnest. But at Thermalito Afterbay on the Feather River, the state is stocking a quarter of a million steelhead and feeding bass. And the feds are will be stocking a half-million endangered winter-run salmon hatchery smolts near Redding in February and March. The striped bass will soon decimate the Feather River steelhead and will be well positioned for the annual April hatchery salmon smolt stocking season in April. In the meantime, the stripers attracted by massive chumming will be knocking off the wild juvenile salmon and steelhead heading for the ocean. Why do hatcheries continue to waste so many of the over 20 million salmonid smolts raised each year to mitigate for all the dams on Central Valley rivers? Smolts cost more than $1 each to raise. Hatchery managers and their partners need to barge hatchery steelhead and fall-run salmon smolts to the Bay. Barging smolts would likely increase adult returns sharply in coming years. Both steelhead and salmon populations are relatively homogeneous genetically, which reduces concerns about the effects of straying. Coleman smolts should be barged from near Hamilton City. 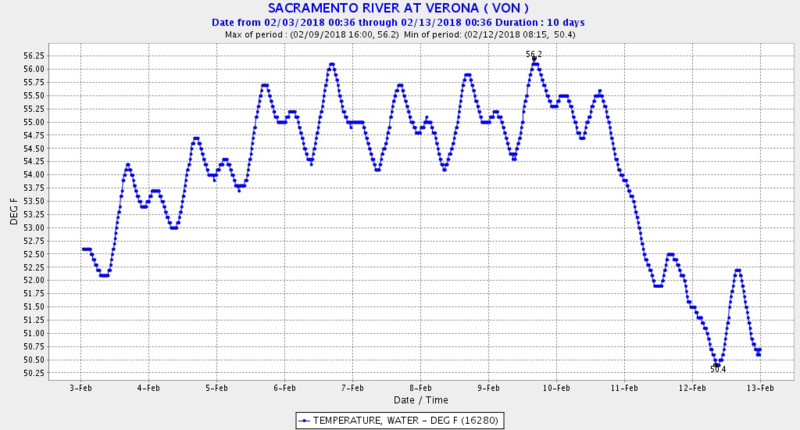 Oroville smolts should be barged from Verona. Nimbus smolts should be barged from Discovery Park. 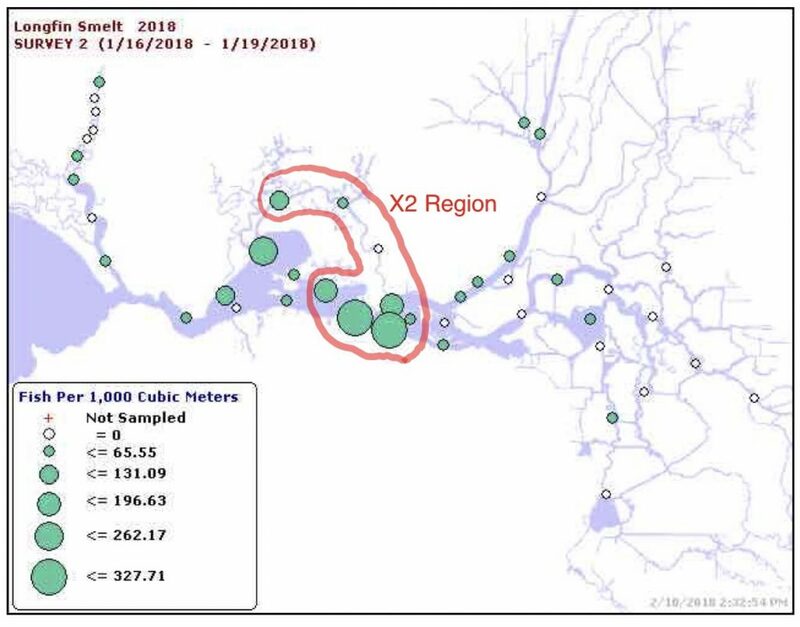 If releases of hatchery smolts into the rivers are to continue, water managers need to at least provide pulsed flows from Shasta Reservoir to help the fish succeed in reaching the Bay and ocean. Shasta storage is 106% of average. A 5% allocation to pulsed flows would amount to approximately 140,000 acre-feet, enough for seven days of an 10,000 cfs extra flow to the Sacramento River. Pulsed flows would also reduce water temperatures. Hatchery managers should also not release smolts into the rivers during warm spells that stimulate striper feeding. State hatcheries plan some trucking of salmon smolts to the Bay-Delta this year, as they have done in past years. Trucked fish should also be barged or at least taken to the Golden Gate, not just to Rio Vista. 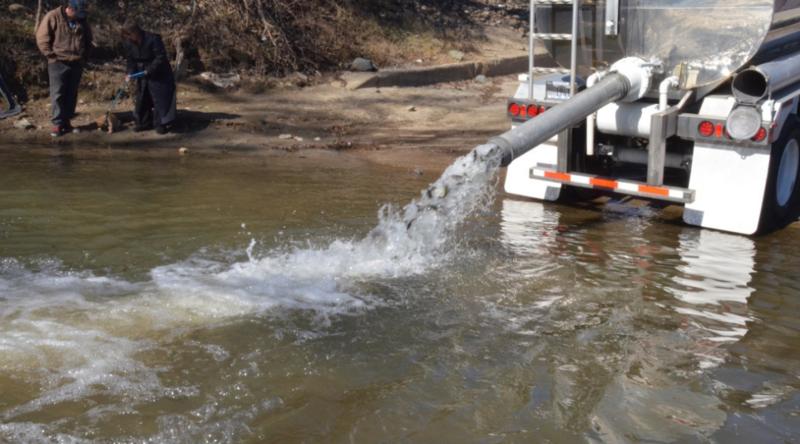 In addition to barging and trucking, and pulsed flows, hatchery managers need to accelerate a pilot program to stock hatchery salmon fry into lower river and Delta floodplain habitats for rearing closer to the Bay. In these habitats, fry would grow faster than their hatchery counterparts and get to the ocean quicker. Anglers should take advantage of the great striper fishery. But let‘s at minimum give the salmonid smolts some chance of reaching the ocean, so we can also once again have great salmon and steelhead fisheries. Figure 2. 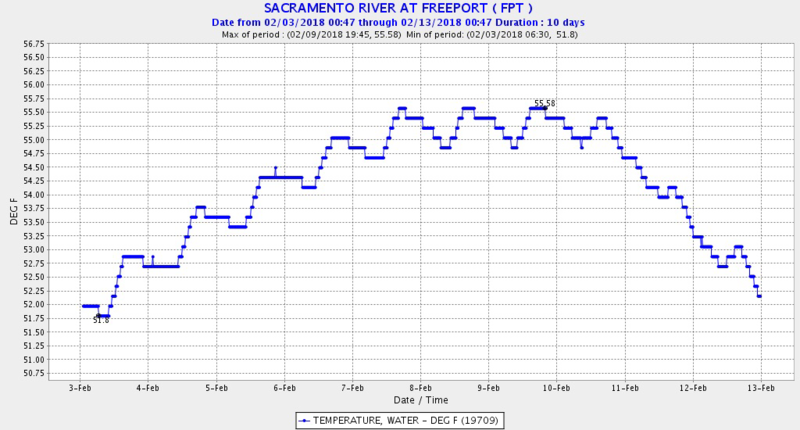 Water temperature in early February 2018 in the Sacramento River below the mouth of the American River near Sacramento. Figure 4. 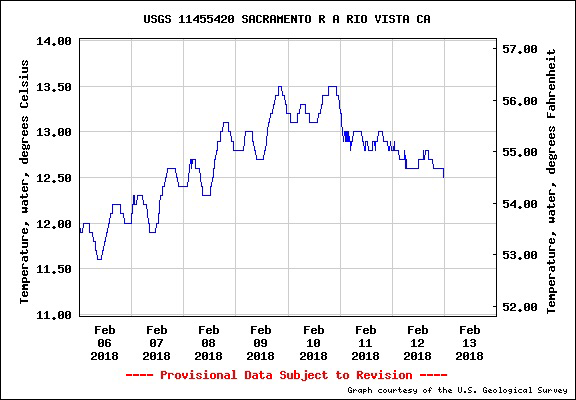 Water temperature in the lower Sacramento River in the Delta near Rio Vista.